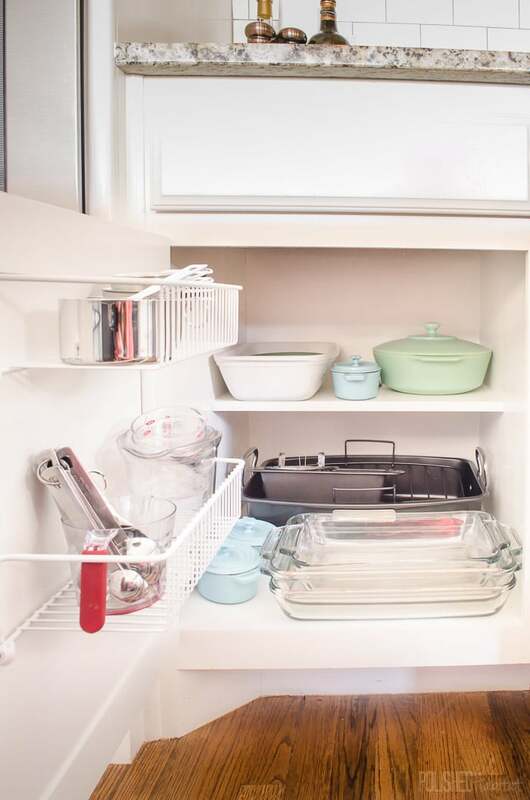 Using vertical space is one of my favorite home organization hacks. 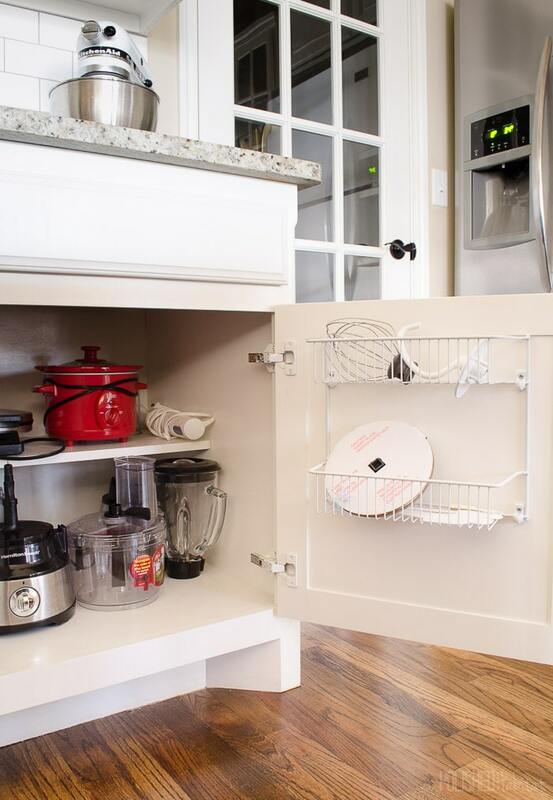 You can add storage to small unused areas. Once I realized that the backs of cabinet doors were basically wasted organizing potential, I was pretty excited by the possibilities. 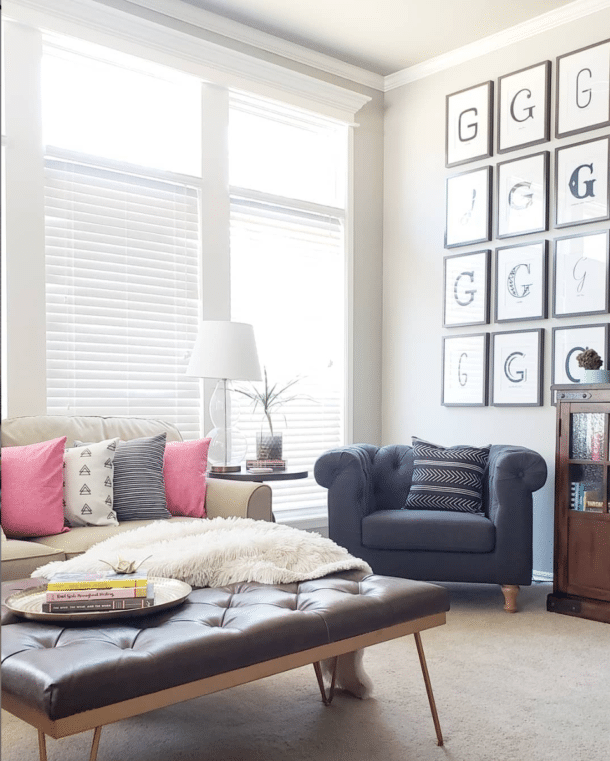 Most of these projects can be done in just a few minutes in rental-friendly ways! 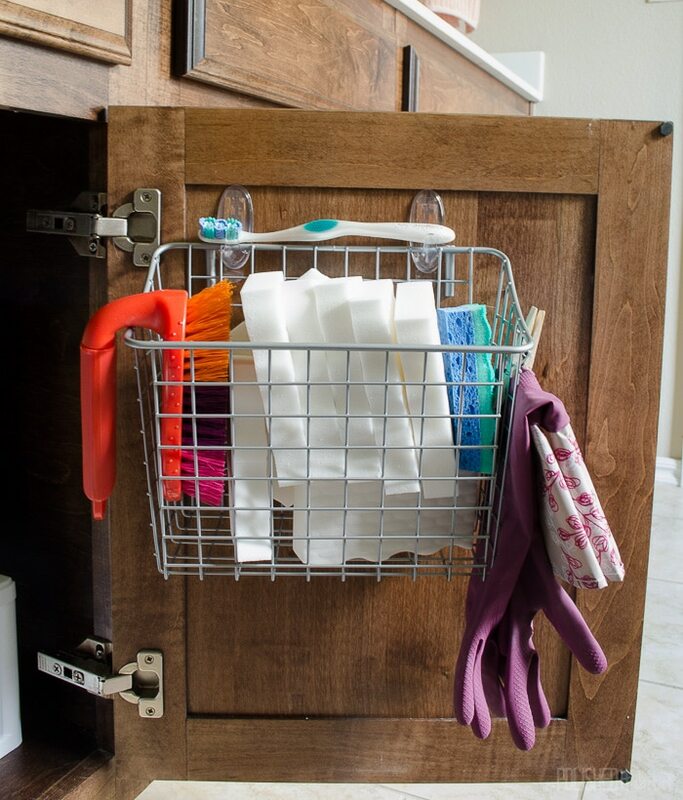 My whole cabinet door fascination began when I needed an inexpensive and convenient way to store dish gloves under the sink. This almost free, five-minute project continues to be one of my most popular posts. 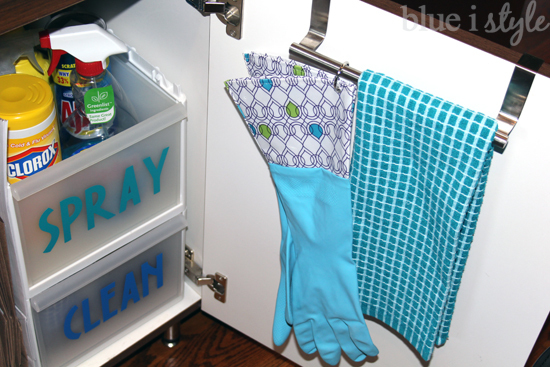 Angela from Blue i Style also likes to keep her dish gloves on the back of her cabinet door, along with a dish towel. 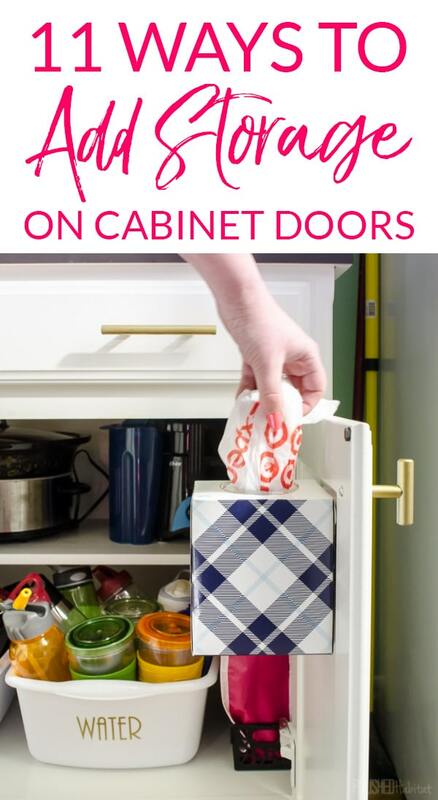 The over the cabinet rod would be a much better solution if you don’t want to do anything permanent to your cabinets. The kitchen organizing opportunities don’t stop under the sink. 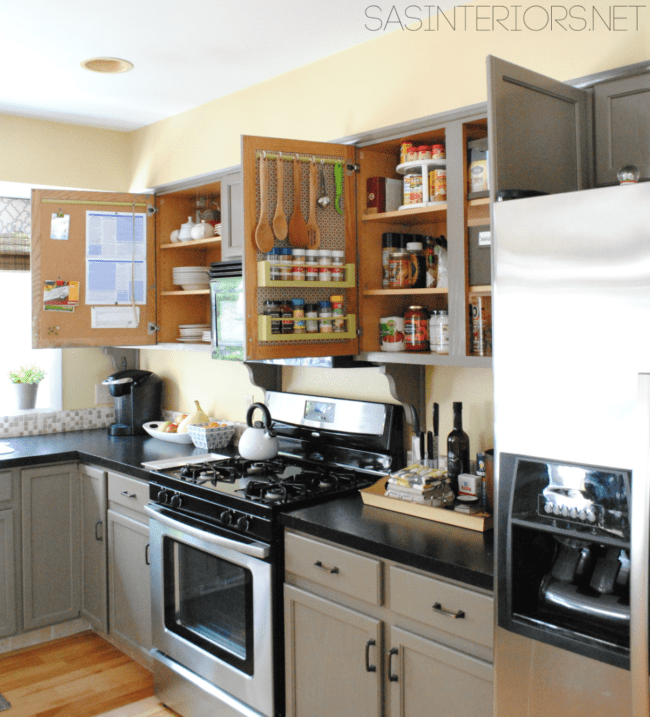 I added storage racks designed for doors on the lower cabinets to hold everything from measuring cups to kitchen aid accessories. When we forget our fabric shoppings bags and get plastic grocery bags at the store, we save them to reuse. I finally figured out how to store them using an old square Kleenex box. 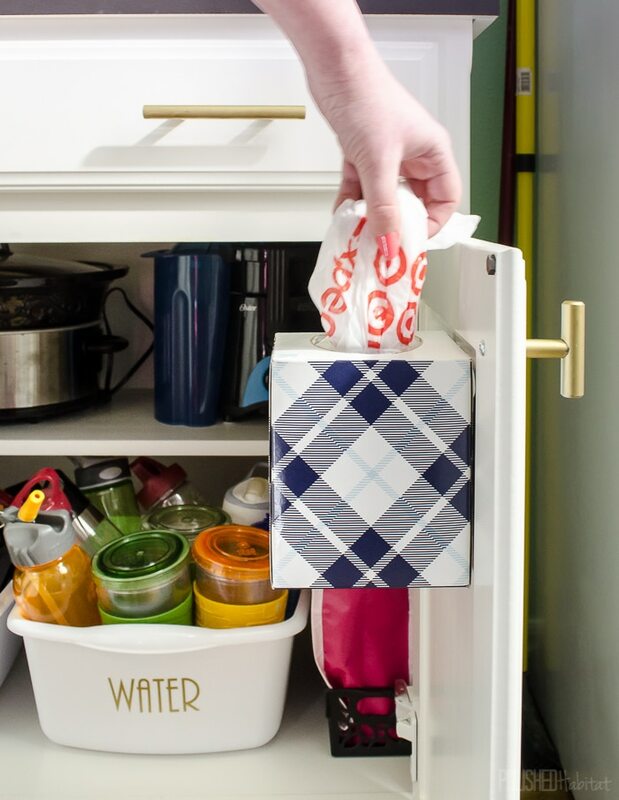 Simply attach it to the cabinet with a Command Strip for easy access! 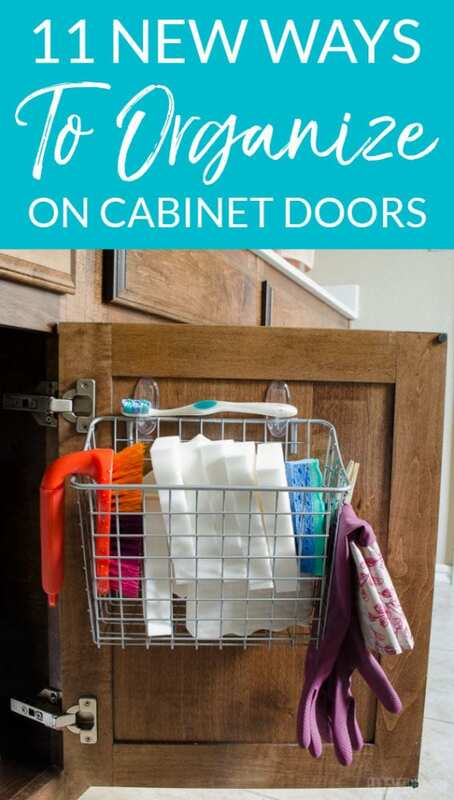 Jenna Burger might be the queen of using her kitchen cabinet doors. She made a corkboard in one door, and a combo utensil holder/spice rack in another. Make sure you check out her full post, because there is a third brilliant idea you can’t see in the photo below! The bathroom is another great spot to optimize your doors. 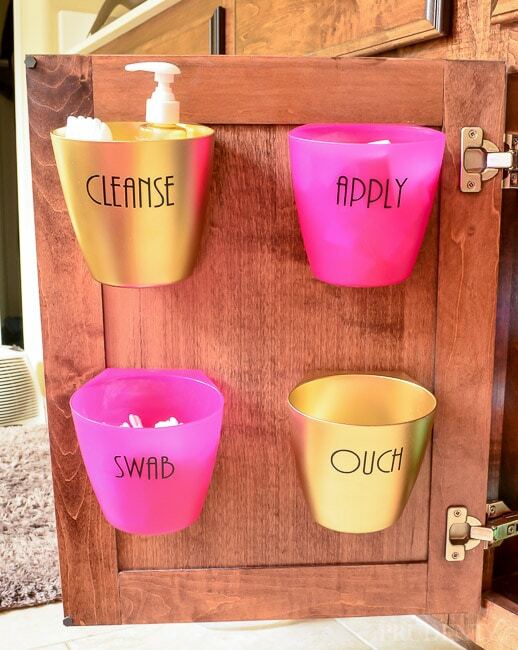 I added Bygel containers under my sink to hold items I use frequently like face cleanser, foam wedges, QTips, and face wax strips (ouch!). Under Corey’s side of the sink, I used a wire basket for cleaning tools. You can hang this one with the attached over the door hooks or on Command Hooks. For the second door of that same cabinet, I used clear organizers (again mounted with picture hanging strips) for all of our eye care supplies. Adding dry erase labels keeps help keep track of monthly contact changes. 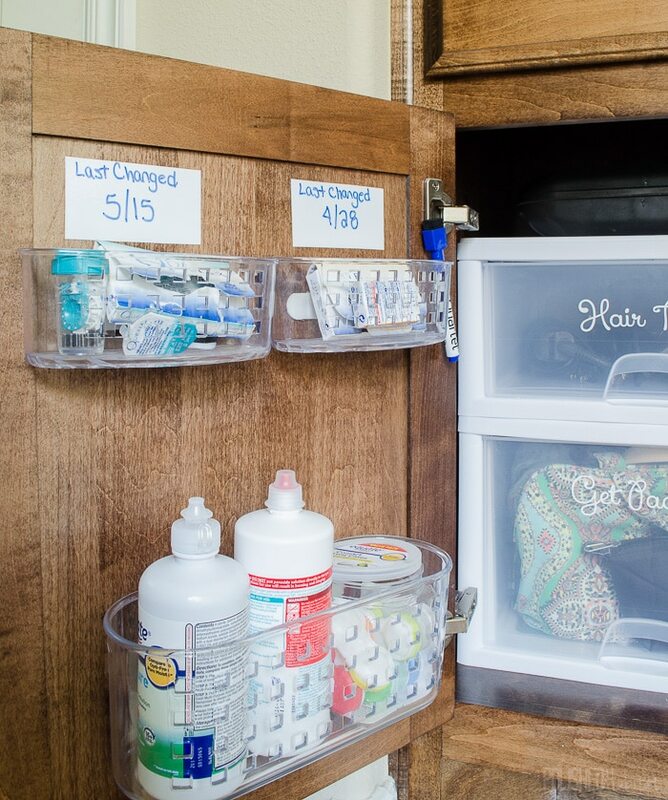 Kimber from The Pinning Mama uses her bathroom cabinet doors to maximize organization as well. I love her easy ideas for makeup brushes and bobby pins! Using a cabinet door is also perfect in a kid’s bathroom. Angela from Blue i Style found a divided bin to use for her son’s things. He loves that he can reach his toothbrush, and she loves that it makes him want to brush his teeth! 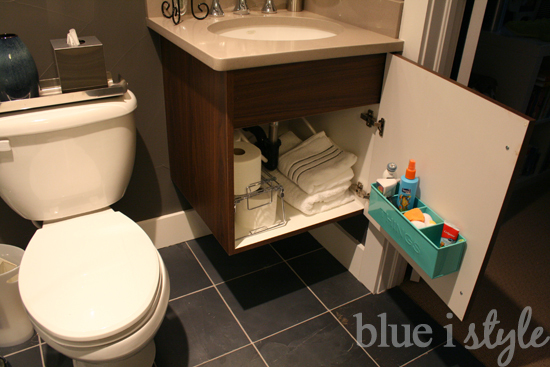 Make sure to click the photo to see the other clever way she organizes despite the small size of this bathroom. We keep Maddie’s things in a lower cabinet in the laundry room. I added a piece of chalkboard vinyl to the inside of the door. Now we have a message board to remind pet sitters how much to feed her, and to keep track of things like her heartworm pills. 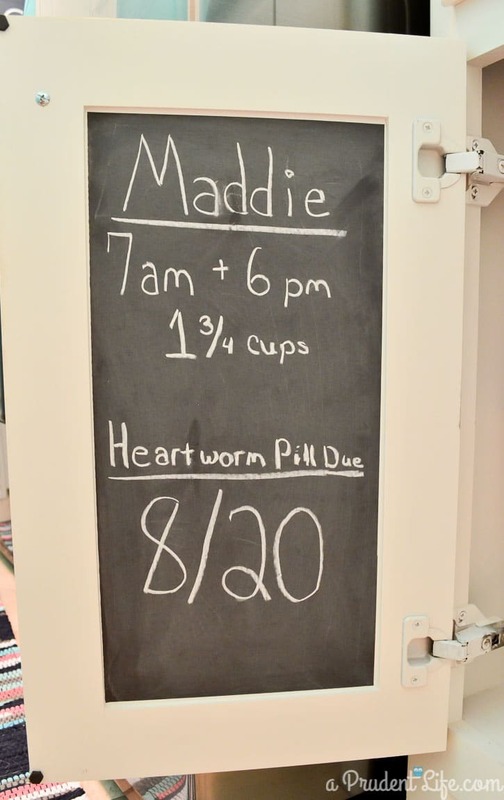 The same idea would work great in the kitchen for important babysitter notes, like emergency phone numbers. Still need more ideas? 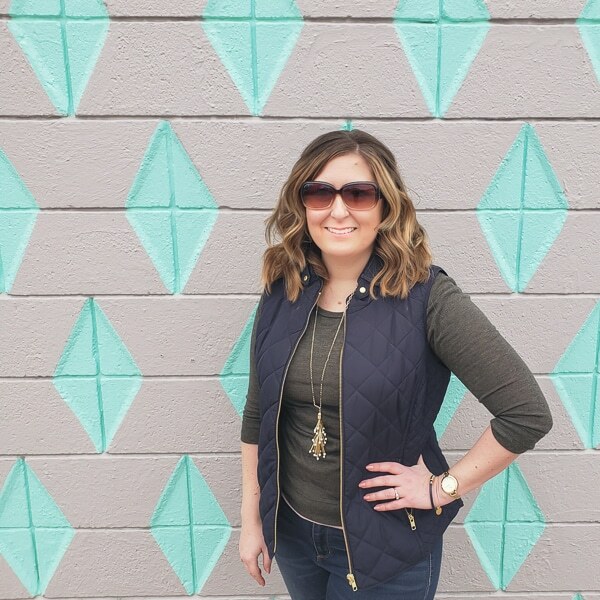 Here are a few brilliant products I found on Amazon! 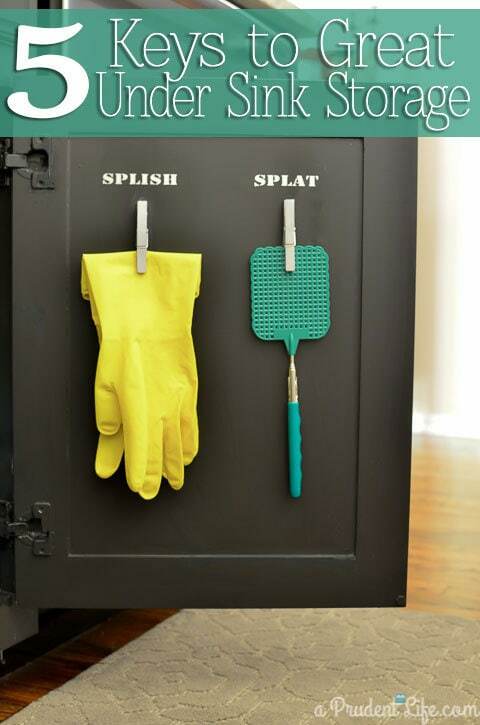 So which one of these ideas do you need to make happen first in your house? Love these ideas? There’s a pinnable image below! Great ideas. I’m off to buy organisers. Thank you. You and your ideas are amazing. Thank you so much for your input and ideas.